We offer bespoke design services to create the headpiece, tiara, crown or simulated and fine bridal jewelry design of your wedding dreams. Creating dreamy Bespoke / Custom Veils, Headpieces, Bridal Tiaras, Crowns and Bridal Jewelry for our clients is our passion. We can also make Bespoke Fine Jewelry or recreate authentic vintage rings, or combine stones / parts of family heirloom pieces into something bejeweled, romantic and new. 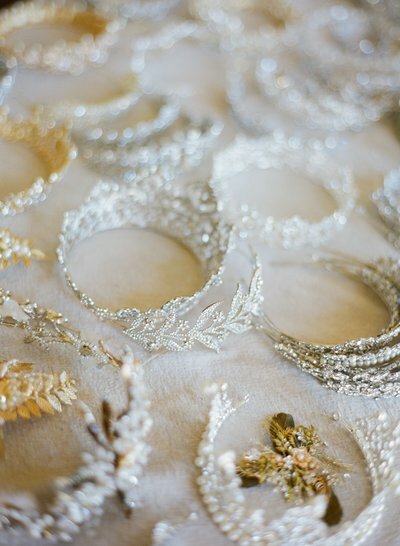 We also have the unique ability to create bridal headpieces using precious metals (Sterling Silver, 14K or 18K Gold or White Gold) with genuine diamonds and precious and semi - precious gemstones. Price is based on design and materials requested.